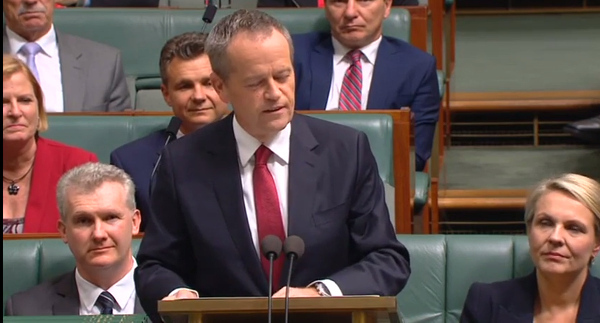 In Bill Shorten's budget reply speech he mentioned climate change 5 times. This was five times more than Treasurer Scott Morrisson used the term in his budget speech. It was a positive and inspiring speech covering the traditional Labor concerns: Jobs, Education, Medicare, Climate Change, Affordable housing, fair taxation, Equality for women, and belief in young Australians. But, like the Treasurer's speech two days ago, reference to refugee detention on Manus Island and Nauru was absent. The speech comes as Essential Vision polling published 3 May shows Labor ahead on two party preferred figures of 52 per cent versus 48 per cent for the Coalition parties. Roy Morgan polling also shows ALP in front but Election too close to call: ALP 51% - L-NP 49%. The Paris Agreement requires that we transition to a zero carbon economy by at least the middle of the century. Transition should be an important economic consideration. The comparison between the Coalition parties and Labor (and the Greens) could not be more stark as contained in the Treasurer's budget speech, and the budget reply speeches of Bill Shorten and Senator Richard Di Natale. Here is the section on climate change excerpted from Bill Shorten's full speech (SMH). You can watch Bill Shorten's full budget reply at Malcolm Farnsworth's channel on YouTube. Full employment and creating better paid and better-protected jobs is Labor's economic priority. The jobs of the future will be powered by infrastructure and renewable energy. Taking real action on climate change will create new jobs, attract new international investment and power our industries and services. But delaying action will be a hit on Australians' cost of living, a drag on our nation's economic growth and an attack on our farmers' way of life. More than this – it would be a betrayal of the duty every generation owes the next – to hand down an environment in a better state than the one we inherited. Refusing to act on climate change will leave Australia isolated from the biggest economic opportunity of the next few decades. By 2030, there will be $2.5 trillion of investment in renewable energy in the Asia-Pacific. Australian workers should be collaborating with our universities and researchers to design, manufacture and export battery technology, solar panels and turbine parts. These are not niche markets or boutique industries. Embracing clean technology and renewable energy can revitalise advanced manufacturing in this country. In the last two years, the global economy added 2 million renewable energy jobs – but Australia lost 2,600. The world is powering ahead - and we are going in the wrong direction. It's time to turn things around. Which is why a Labor government will deliver 50 per cent renewable energy by 2030. Labor released it's Climate plan last week which I described as positive and nuanced, although still not going nearly far enough with a big silence on fossil fuel subsidies and stopping new coal mines and start the phase out of export coal. By comparison you can look at the scorecard compiled by the Australian Conservation Foundation on the Government's Climate and environment record. So how did the Prime Minister Malcolm Turnbull and Treasurer Scott Morrison react to Shorten's speech?